This is the result of our "liberation" of Afghanistan. Malnutrition rates have doubled since 2001. We bombed the country from 30,000 feet, killed thousands, and now we're abandoning it. 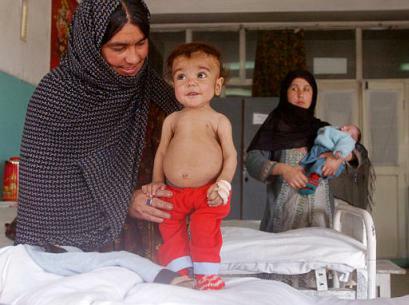 Suffering from severe malnutrition and a distended stomach, Ahqel Khan, 2, of Khost, smiles as his grandmother, Khatou, helps him stand, at the Indira Ghandi Children's Hospital in Kabul, Afghanistan, Feb. 25, 2003. Khan's development skills have been severely stunted due to his malnutrition, and he is still unable to crawl or walk. Dr. Assef Ghecy of the French non-governmental organization Action Contre de la Faim, says that the percentage of children in Kabul suffering from severe malnutrition has increased from 6 percent in 2001 to 11 percent in 2002. This is largely due to inadequate living conditions for recent refugees returning to Afghanistan. Are you really concerned, adopt them, and send them money every month, but, will that really solve their deeper problems? THe United States cannot feed the entire world. If the Islamic nations, and the Arab League, gave a damn about the condition of the community, they would fight the greater jihad, and improve the condition of everyone throughout Islam, instead they want to blame the condition of Islamic nations on Israel and America. The solutions for the problems of Islam lay with the Islamics, but when they attack our nation, we are dragged into their sphere of 24 hour craziness. You ought to pity the American people because they're putting aside the relative peace of isolationism and are letting themselves get emeshed in the ancient hostilities of others. first, the word is "muslim" not "islamics" (in arabic the "mu-" prefix indicates a person that does something. so muslim is the one who practices islam just as mujahid (singular of mujahideen) means one who does jihad). fourth, even if the muslim world should be doing more, that does not change barry's point that any bombing of iraq will have disasterous consequences for the people of iraq. fifth, your use of "they" in "when they attack our nation" in your post is misleading. the boy in the picture did not attack this nation. nor did any afghans, nor any iraqis. the underlying assumption of your post is either that all muslims are responsible for september 11th or that that only other muslims should look out for muslim children. i disagree with both assumptions. those are the reactions that immediately pop into my head. I have been unable to get that kid out of my head ever since seeing his picture in the paper last Sunday. He is undoubtedly the cutest little kid in Afghanistan. I don't believe we're allowing this to happen. Something has got to be done for him. What? How? P.S. I don't subscribe to your apparent political views, but one doesn't necessarily preclude the other. Published on March 2, 2003 3:14 PM.